A few of the sketches I have worked on lately. I have a lot going on inside of my brain. A million different thoughts in ten thousand directions. A portion of these thoughts work their way out through my right hand and onto a lucky piece of paper. Usually I tend to draw on scraps or little notepads. It seems too official to sit down with a large drawing pad filled with archival acid free sheets and try to come up with something. I like to draw with a Sharpie pen and then add details with a ball point. Fancy, huh? I could spend a lot of money on fine art materials but I have never understood all of that. The next step for my illustration work is usually to scan it into a digital format. Then I develop it from there. (Maybe I will discuss that process on another day.) 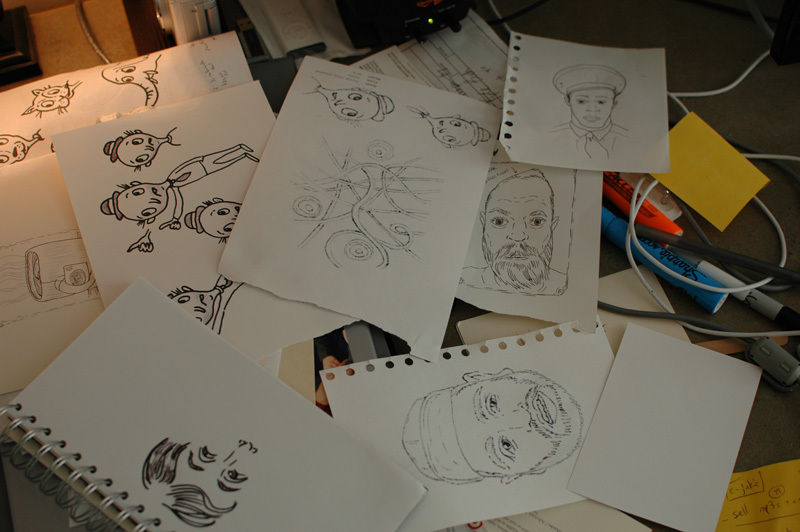 So, I am then left with a lot of doodles on scraps of paper. I keep some of them and throw others out. They usually pile up in corners and around my keyboard until I decide something must be done. Maybe I need a 1984 Orwellian vacuum suction shoot next to my desk which would immediately take my paper scraps away and incinerate them in the basement. Maybe I could frame them and sell them on the street corner. Perhaps I could learn origami and make a series of hats for my dog. Either way, I will keep drawing. If you have any ideas for the left over doodles you can let me know. This entry was posted in illustration and tagged art, blackcattips, explode, kyle brooks, painting, sketches. Bookmark the permalink. I say those doodles and original sketches will be valuable one day, so let me keep them in a big box and I will have retirement money. Look at what people think about sketches left behind by Leo da Vinci.